Behind The Mic—Guest Don Stevens – Welcome to the 2019 Beemie Awards! I had the good pleasure to meet “Delta” Don Stevens in 2006 while announcing at River Downs. Don is super cool guy and a Seahawks fan which scores him major points with me and everyone here in the Northwest! Don has a very interactive show at Delta Downs while calling the races as well. It’s truly one of the more unique broadcasts in horse racing today. We all remember our first race call…tell me about yours? DS: I was as nervous as you can imagine. It was a 12-hrose field going 1-1/16 miles at Remington Park in October of 1996. I had called many races on the roof of the track for practice in the years before that day, but that was my first real call of a race over the public address system and not into a tape recorder. After the horses broke from the gate I was able to spit out the first few runners as they went around the first turn. When they reached the backstretch they bunched up and I was shaking so badly that it was impossible to see them through my binoculars. I did the best I could but I could only get out the first five names or so and then went back through them again and again. Luckily one horse, named Bourbon Straight Up, led pretty much every step of the way, but in the homestretch a horse began to close from well behind and I scrambled to find his name. As they hit the 1/16th pole I decided it was a horse named Colosso, who ended up winning by a head after going from last to first. After the race I couldn’t turn off the microphone fast enough as I took a deep breath and questioned whether this profession was really something I was up to. I’ve been a track announcer now for 17 years, so I guess I answered that question but it wasn’t easy in the beginning. What do you remember about the day you got your first announcing job? DS: I was the heir apparent to Jim Byers at Delta Downs and we all knew he was considering changing sports and leaving racing. He did just that in 1999 when they gave me the job after serving as his backup. I wasn’t surprised when it happened, but I did feel a sense of accomplishment that I had made it to that level, and I knew it was a challenge to get better at my craft every day. Some announcers have had to move a lot to pursue this dream. How many times have you had to move? Any good stories from the road? DS: Actually I have only moved once in my announcing career. I worked at Remington Park in Oklahoma from 1996 -2003 in various jobs including backup track announcer from 1996 – 1999, and full time announcer from 1999 – 2003. 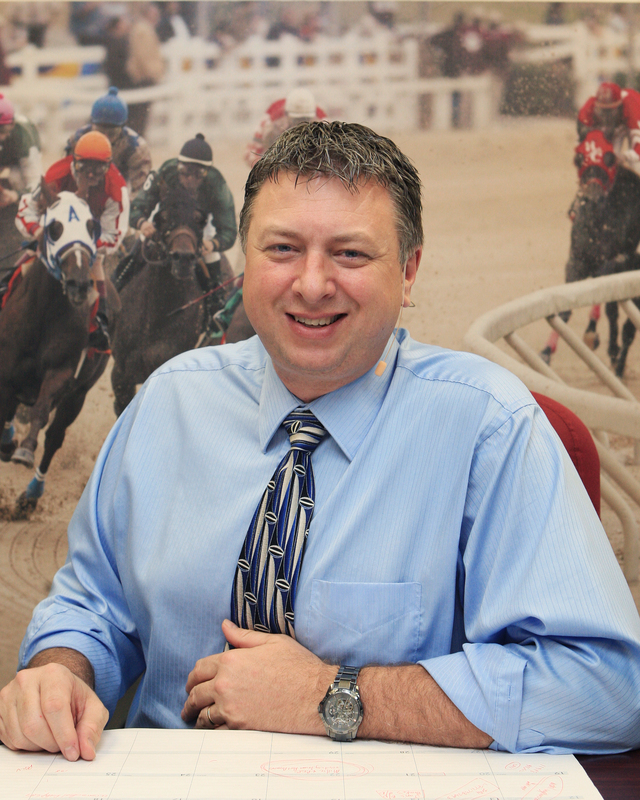 In 2003 I accepted the job as announcer, handicapper and simulcast show host at Delta Downs in Louisiana and I have been here ever since. I have filled in as the announcer at the old Evangeline Downs, the new Evangeline Downs, Louisiana Downs and Blue Ribbon Downs in Oklahoma during my career but none of those required extensive travel so I guess I’m a disappointment when it comes to nightmare travel stories. Sorry. Ever had any crazy guests in the booth? DS: A few years ago on Halloween Night I had about five women dressed up in wild costumes and makeup enter my booth about one minute before a race. They had been drinking and eating dinner in our Lookout Restaurant at Delta Downs and were quite lively as they stood behind me and over my shoulder during the race call. Obviously it was rather hard to concentrate on making an accurate call but somehow I got through it. I also met legendary race caller Dave Johnson in 2010 for the first time when he visited Delta Downs for the $1,000,000 Delta Downs Jackpot. He came into my booth and we shook hands on a Friday night before the Jackpot as he was going to call a race himself to the delight of the fans. But he wanted to get into the booth early to get situated and watch me call a race first before he did it. Obviously I was rather in awe of Johnson as I had listened to many of his 25 years of the Triple Crown races and heard his signature line, “And down the stretch they come!” so many times over the years. My race went fine and he complimented me several times on the job I do, but needless to say it made that one race call rather intimidating. Do you remember your worst race call and what was it? DS: My worst call probably came at Remington Park in my early years when a horse named Sassy Sues Slew went wire to win in a route race and I kept tripping over her name. Once I screwed it up I just couldn’t get it right. Kind of like trying to say she sells sea shells by the sea shore many times fast. I can laugh about that race now, but at the time I was pretty upset about how I messed it up completely. DS: The race calls are fun, and so is the handicapping when I pick several winners or give out a nice exacta or trifecta on a program. But I would have to say my favorite part of the job is interacting with the race fans, both in person and through email and social media. I have made so many lifelong friends simply because a fan has sent me an email or come up to talk to me and we just hit it off. Tell us about your booth? Is it on the wire, big, small, good sight lines, windows etc? DS: My booth at Delta Downs is 12’X16 feet and it is rather nice compared to many tracks. It also serves as my office since I do all the track’s media work. This one was rebuilt after Hurricane Rita hit the racetrack in 2005 and I had a lot of input into how it was laid out. My view is about 10 feet or so before the finish line and our pan camera obstructs my view of the first turn for about 10 seconds when we run multi-turn races. That’s something I have had to get used to over the years but now I just use my monitor and the pan camera shot becomes my eyes for a few moments. Most of us are bettors, what’s been your most memorable score? DS: I’m not a big time bettor although I do bet races. By that I mean I play, but not for big bucks. One of my biggest scores was on a 10-cent superfecta a couple of years ago on a simulcast of the Quarter Horse season at Louisiana Downs. I only played a few dollars on a ticket that keyed one horse over about five others. I hit the bet and the winner was 5-1 odds, the second horse was 9-1, the third horse was 12-1 and the fourth horse was something like 20-1. I really thought I would win about $300-$400 for the dime bet but when the payoff came up it was $1,923. Obviously I was pleasantly surprised. And when I looked up the chart of that race I found out that I had scooped the entire pool, which was only about $2,500 before the 25% takeout. Needless to say my family and I ate well that night. It seems every announcer I know has a memory of the great Luke Kruytbosch, what is your favorite one? DS: I never met Luke in person but everyone, and I mean everyone, I have ever talked to that knew Luke spoke very highly of him. That’s how I’d like to be remembered when I am gone. If no one can come up with a bad word to say about me, then I guess I lived a pretty good life and treated people well. Sometimes part of our jobs is to announce random promotional events in addition to the races themeselves. What’s the strangest thing you’ve had to announce? DS: Since I work for a casino company, Boyd Gaming, I have done several voice overs for casino promotions. The strangest of those was cartoon pig races that they play on monitors in the casino during cash giveaways. They let me have free reign and I have a lot of fun with it. Other Boyd Gaming casinos have also had me to this kind of work for them. It’s a blast. If in 2014 you have a “Call any race you want” card, which race would you cash it in to call? DS: That’s a really tough question. I get to call the $1,000,000 Delta Downs Jackpot each year and it is a grade III event so that is really cool. But if I had to narrow it down to any other race in the country I’m not sure I could. The obvious answer is the Kentucky Derby, but there are a lot of other events that would intrigue me too. If I’m in Vinton, Louisiana and want a good meal, where are you sending me? DS: Obviously the Lookout Restaurant at Delta Downs. It’s only about 50 feet down the hall from my announcer’s booth and they have some of the best food anywhere on the Gulf Coast. They bring me food to show on TV occasionally and I get to eat it of course and I have never been disappointed. As far as one dish goes, I would have to choose the New York Strip. It comes with side items and it is cooked to perfection – very mouth-watering. The staff in the Lookout is also second-to-none. They do a fantastic job night in and night out.